You probably don’t think much of plugging in your smartphone every time you get into your car, and unplugging it every time you get out, but you’ll realize how tedious it was once you experience iOttie’s One Touch Qi car mount. I ran an extra long microUSB cable from my car charger (at the bottom of the photo) under the steering column, up the driver door’s weather seal, and under the windshield, and now I don’t have a cable hanging out in front of my dashboard buttons. This is the best reason to buy this product. 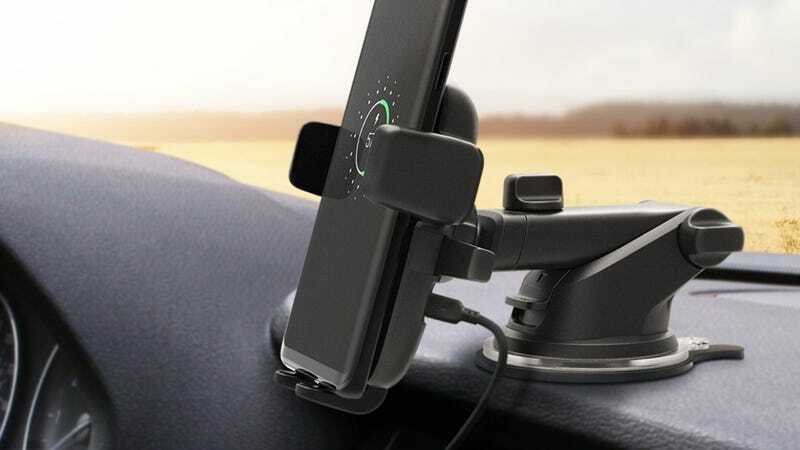 I’ve been driving with this thing for a month now, and it works exactly like iOttie’s other One Touch mounts, except that when you snap your Qi-compatible phone into place, it starts charging. That means no cords to find and plug in, and if you take the time to hide a long microUSB cable in your car’s trim to plug into the mount, it means no cords dangling in front of your dashboard period. Now, Qi charging isn’t as fast as wired charging—for iPhones, this pad maxes out at 5W, though some phones can accept 10W—but I’ve found that the iOttie at the very least maintains my iPhone X’s battery level at full brightness with GPS running. Usually, that’s all I need, but if not, I can still just plug in a Lightning cable like I used to. A word of caution though, if you share your vehicle with someone who owns a different phone than you. You have to adjust the height of the mount’s feet to line up the coils properly with your phone’s (I failed to do this at first, resulting in very slow charging), and it would frankly be too big of a hassle to constantly adjust it for multiple phones.